Pediatricians specialize in the medical care of children. When you’ve decided on a career in health care and you are pretty sure you want to work with children, your friends may envy you for options you can choose from. Does the choice come down to the full court press to become a doctor, or do you head in the direction of advanced practice nursing as a nurse practitioner, or NP? It’s a big decision and could affect your career for many years, because the two professions differ in many ways. 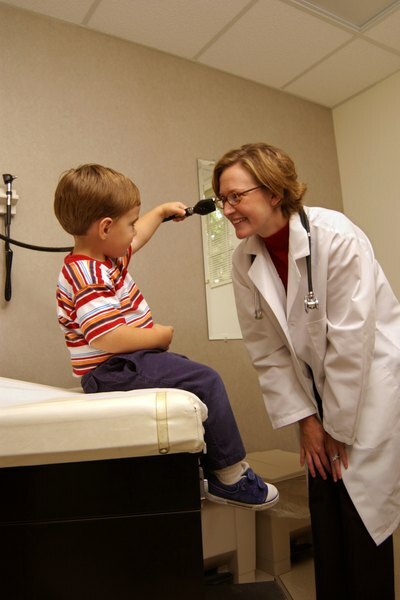 Pediatricians are specially trained doctors who work with children. They may be medical doctors -- MDs -- or doctors of osteopathy -- DOs. The differences between the two degrees are not major, and either can be a pediatrician. If you take this route, expect to go to school for at least 11 years. That’s right -- four years of college, four years of medical school and at least three years of residency. You may also want to go on for extended training in a pediatric fellowship. After you do all that, you are ready to practice medicine. A nurse practitioner starts her career as a registered nurse by graduating from an associate, diploma or baccalaureate program. An associate degree takes two years, a diploma two to three, and a baccalaureate usually takes four. If she doesn’t already have a bachelor’s degree, that’s the next step. At that point, she enters a nurse practitioner program, which takes two to three years and results in a master’s degree as a nurse practitioner. Nurse practitioners are generalists who perform many of a physician's duties, such as prescribing medications or diagnosing an illness. They may work in family practice, pediatrics, geriatrics or a specialty such as orthopedics or cardiology. Pediatricians and NPs may become certified in their respective specialties. 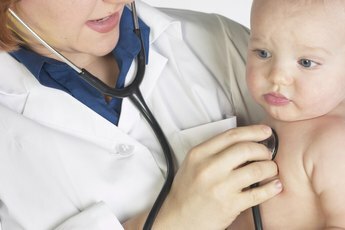 Pediatricians pass an examination given by the American Board of Pediatrics. NPs have two options -- certification from the American Nurses Credentialing Center or from the American Academy of Nurse Practitioners. Certification is visible evidence of knowledge and expertise, but maintaining it takes work. You have to renew a certification every five years, either by hitting the books for continuing education credits or by taking the test again. Each profession has its advantages. A nurse practitioner usually must work under a supervising physician, while a pediatrician is an independent practitioner. On the other hand, it’s easier for a nurse practitioner to switch gears and change from pediatrics to adult medicine if she wants to; a pediatrician would probably have to go back for a second residency or fellowship. Either may work in private practice, a clinic or a hospital. Pediatricians may choose to specialize in a field such as neonatology -- the care of newborns -- or a particular area, such as pediatric cardiology. As generalists, NPs have many more options for specialization, although some areas may require extra training. Pediatricians have an advantage over NPs when it comes to salaries. Pediatricians earned an average annual salary of $168,650 in 2011, according to the Bureau of Labor Statistics. An NP in pediatrics earned considerably less than that -- $87,610 a year in 2011, according to the American Academy of Nurse Practitioners. An NP who specialized in neonatal or newborn care, however, could earn as much as $107,550 a year. 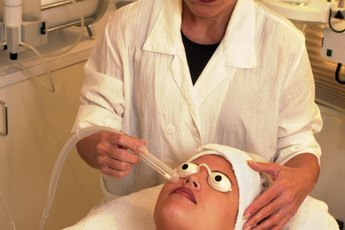 The average full-time income for NPs in general, however, was $98,760 a year in 2011, according to the American Academy of Nurse Practitioners.